Written by Marina Pape on January 22, 2019 Blog, Product news. 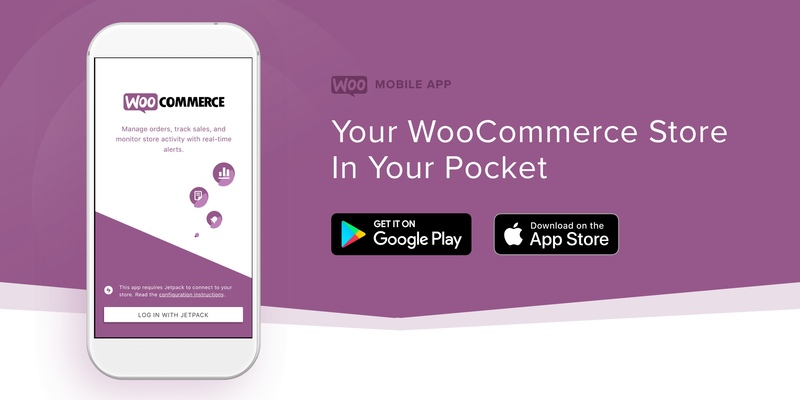 However, whenever, and wherever you manage your store, the new WooCommerce Mobile App puts WooCommerce in your pocket for at-a-glance metrics, notifications, and more. The first app we released was iOS-only, but we’re pleased to have released the new and improved version for both iOS and Android. Track your store: See which products are performing best and check your overall revenue, and view order and visitor data by day, week, month, or year. See at a glance which products are performing best. Get notifications about store activity. The WooCommerce Mobile App is free and available today in the iOS App Store and Google Play. There is detailed documentation for iOS and Android to guide you. Like the WooCommerce plugin, our app is open-source and the code is available on GitHub – iOS and Android – should you wish to explore it further. If you have an idea or suggestion for the mobile app, we’d love to hear it: search the public ideas board and sign in to upvote or add new requests. The Jetpack plugin (the free plan is fine), connected to your store. As part of the required connection to WordPress.com, Jetpack caches* data locally on the WordPress.com servers. If you’d like to know exactly what data Jetpack syncs, here is the full breakdown. At Automattic, we name our teams all kinds of strange things – like Alpha, Air, and Helios. In this case, Hogsmeade is the magical team that did the majority of work to bring your new app to life. Three cheers for Hogsmeade! Here they are on a team meetup in 2018. We hope you’ll try — and love — the new app! Let us know in the comments about your experience. P.S. We’re grateful to everyone who signed up for beta testing, gave feedback, and played a role in the development process. If you’re interested in helping us to test WooCommerce core releases, future app features, or anything else, sign up for the Design Feedback Group. *EDIT: 24 January 16:01 UTC: We removed the phrase “shadow site” from this section as it sounded weird and doesn’t best reflect what’s actually happening – which is just standard cloud data backup. Finally. Lots of hope to this. Have been testing them in beta for quite some time. Do you plan to offer a way to login without Jetpack? Hi Andrei. Login without Jetpack isn’t in the roadmap as things stand. The only constant in the world is change, so this could change, but there is no plan for this for the foreseeable future. The dependency on Jetpack is really, really bad. For any client I work with this is just unacceptable – and I fully agree with my clients on this one. If there was anything missing API-wise then this should have been added into WooCommerce itself or into a simple “connect” add-on or something like that. Thanks for being honest with your thoughts on this, David. I checked up with the mobile dev team to give you a proper answer here and they said that communicating directly with WooCommerce sites presents a number of challenges dealing with disparate server configurations, web hosts firewall rules, and the list goes on. Providing centralized services like notifications requires a trusted third party service, like Jetpack, to provide a reliable way to connect and communicate with sites. The choice of Jetpack itself was an internal decision because we own that entire infrastructure. Coming up with a separate infrastructure to solve all of the problems Jetpack solves is hard for Automattic to justify. I hope that answers you somewhat. There are a couple of other free/paid apps in the app stores, have you tried any of them, out of interest? Great update… Thanks for sharing..
glad this is much easier to use than the old app where you had to copy and paste the secret keys from the wp-admin and pass over to the app. I loved your performances and am using all your services to implement my Vonage Website building. I installed the WooCommerce mobile app on my iPhone 7. It’s pretty basic, but it gets the job done. Note that it requires the Jetpack plugin. Hola! Tengo problemas para conectar mi nueva app de woocommerce con mi sitio web. Como me puedo conectar son servicio al cliente? MI anterior app de woocommerce trabaja sin ningún problema pero no puedo acceder a la nueva app. This is such a nice app I’ve used this App and it helps me. Doesn’t let me connect. Keep getting an error. Called your support team, just waiting for update. If it was a ticket would you have the ticket number on hand, I could look into that for you ASAP. This app is really good and i really enjoy it. Thanks for such a great app. !! I will try WooCommerce mobile app for sure in my Android phone. New woocommerce mobile apps is really awesome, very user friendly for end user. Woocommerce is the best platform for ecommerce. After releasing apps, it is really very much user friendly for us. E terminado migrando ni tienda a woocommerce y la app espectacular….. Gracias.. This is app is really awesome very interesting, and I enjoyed this App. Can we install the jetpack app on 5.1.1 OS Version?????? Most effective information for the new e-commerce site builder. Nowadays the mobile device is the most essential parts of life so if we solve our problems with this it will be a great solution. Something I wanted for a long long time. Thank you! This is an awesome APP. Your post will be helpful for me. Thanks for sharing. Good work, Keep writing & waiting for next post!!! Already using it and we love it. Would be great if we can also add/edit product from the Android app. It’s available without Jetpack? I mean login without Jetpack. Hello 🙂 No, the app requires Jetpack. Awesome, so glad they have this now! Going to download it asap! Thanks for the share, very informative. Its very nice to read this. amazing app and very helpfull article, rally love it.